GAMIAN-Europe (Global Alliance of Mental Illness Advocacy Networks-Europe), is a patient-driven pan-European organisation, representing the interests of persons affected by mental illness and advocating for their rights. Its main objectives are: advocacy, information and education, anti-stigma and discrimination, patients’ rights, co-operation, partnerships and capacity building. GAMIAN-Europe was established in 1998 as a representative coalition of patient organisations. Putting the patient at the centre of all issues of the EU healthcare debate, the organisation aims to bring together and support the development and policy influencing capacity of local, regional and national organisations active in the field of mental health. Patients can and should play an effective and complementary role in developing positive and proactive policies and other initiatives with an impact on mental health issues. 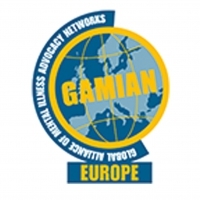 GAMIAN-Europe, as an informed and effective advocate, is seeking to become a powerful and trusted point of reference for the main EU institutions and other organisations and stakeholders seeking the views of patients. To assist in the creation, growth and development, where appropriate, of patient groups in all European States focusing on mental health. Christine is EU liaison officer in GAMIAN-Europe since 2008 and has set up and now coordinates the European Parliament Interest Group on Mental Health, Well-being and Brain Disorders on the organisation’s behalf. She is also in charge of GAMIAN-Europe’s policy and strategic outreach with respect to the European Parliament, Council of Ministers and European Commission, and advises the organisation on EU advocacy strategies and activities. As a project team member, she was /is co-responsible for GAMIAN-Europe’s contributions to the successful EU research projects E-Compared and MooDFOOD. Christine is a clinical psychologist and has worked previously as a psychologist in a nursing home setting in Amsterdam, mainly involved with assessment and treatment aspects of psycho-geriatric patients as well as managing support groups for carers and relatives. As an expert-by-experience, Erik Van der Eycken is actively involved in many activities in the field of mental health care. He is Vice President, Member of the Board of Directors and regional coordinator (self care groups) of a Belgian patient organisation for people with bipolar disorder and chronic depression (Ups & Downs vzw). He is also member of some steering committees and working groups, related to mental health care in Belgium (Community Mental Health Care, Training programs for employment of “experts by experience” in mental health care). As staff member of GAMIAN-Europe, Erik is co-responsible for different activities within this organisation (e.g. General Assembly, Regional and Thematic seminars, Annual Conventions, Patient Advisory boards). By means of his frequent contacts with member patient organisations via conferences, seminars and the meetings of the European Parliament Interest Group on Mental Health, Well-being and Brain Disorders, Erik has gathered the appropriate knowledge and experience to represent the view of patients facing mental health problems. As a project team member, he was /is co-responsible for GAMIAN-Europe’s contributions to the successful EU research projects MasterMind and MooDFOOD. Erik Van der Eycken graduated as Master in Electro-Mechanical Engineering in 1984 at the Catholic University Leuven (K.U.L.). In the past, he has been project leader of many research projects in the industry as well as with academic institutes in Europe.